Hazelnuts have been commercially produced in Oregon since the early 1900s when they were called “filberts.” In 1981, Oregon “filbert” growers began referring to their crop as “hazelnuts” to be consistent with the rest of the world. Oregon’s hazelnut orchards, concentrated in the Willamette Valley, account for 99% of US production and 5% of world production. Eastern filbert blight is a destructive disease of hazelnut trees that is only present in North America. 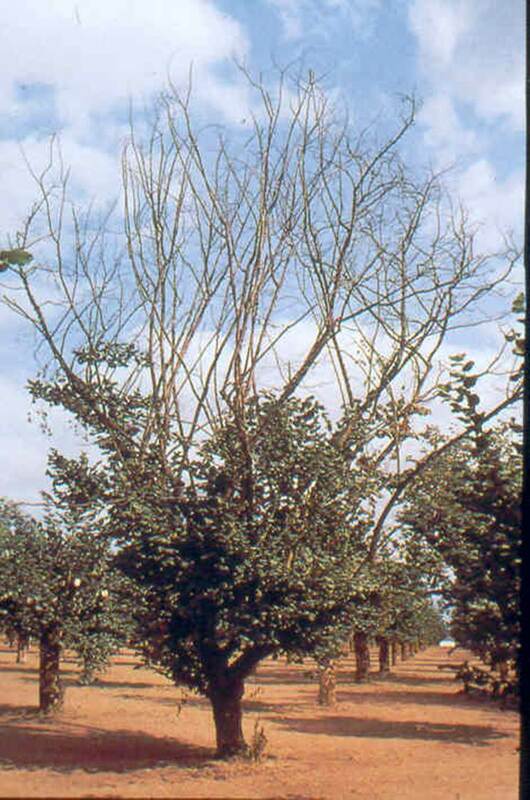 The disease is known as eastern filbert blight because a shrub harbors the disease in the eastern US. In the 1920s, growers tried to start a hazelnut industry in New York. Filbert blight destroyed the trees. In 1974, the disease was found for the first time in Oregon and has spread throughout the Valley. Without fungicide sprays, the blight would kill the hazelnut trees. Authors: Molnar, T. J., et al. Affiliation: Department of Plant Biology and Pathology, Rutgers University. Title: A real-time PCR assay for early detection of eastern filbert blight. Source: Plant Disease. June 2013. 97:813-818.